(Tribune file photos) Utah Rep. Mike Kennedy (left) and former Massachusetts Gov. Mitt Romney face off next week in a primary election for the Republican nomination for U.S. Senate. Washington • Mitt Romney holds a sizable lead over state Rep. Mike Kennedy in their primary battle for the GOP nomination for U.S. Senate, a new Salt Lake Tribune-Hinckley Institute of Politics poll shows. Romney garnered nearly 65 percent of registered Republicans compared to Kennedy’s 23 percent, the poll found ahead of Tuesday’s primary. Romney also carried every category of political leanings among Republicans surveyed, including nearly 46 percent of those who described themselves as very conservative. Some 4 percent of GOP voters said they would vote for another candidate and 8 percent were undecided in the poll conducted June 11-18. The poll, conducted by the Hinckley Institute at the University of Utah, surveyed 356 registered Republicans and has a margin of error of plus or minus 5.2 percentage points. Romney’s campaign declined comment Wednesday. For his part, Kennedy dismissed the poll and said he sees momentum tipping his way. “Our polling is showing differently and we remain focused on working hard to speak with and represent regular Utahns in our fight to change the establishment in Washington and finally reduce our deficit,” Kennedy said in a statement. The Tribune-Hinckley Institute also polled on possible general election matchups between the GOP candidates and Salt Lake County Councilwoman Jenny Wilson, the Democratic nominee for Senate. Romney, the poll shows, would trounce Wilson 58-20 percent if the general election were held now, while Kennedy takes in 43 percent to Wilson’s 28 percent. That statewide poll queried 654 registered voters and has a margin of error of plus or minus 3.9 percentage points. Wilson noted that there’s a lot of time between now and the general election and said Utah voters will see she’s the right one for their support. “Utah’s Senate seat is not a family heirloom to be handed down from one person to another,” Wilson said in a statement. In the primary matchup, Romney has a large money advantage, reporting nearly $2 million in donations in the past two months while Kennedy took in $152,000 in the same period. Romney, who served as governor of Massachusetts and was the 2012 Republican presidential candidate, is a well-known figure in Utah, having been credited with rescuing the scandal-plagued 2002 Winter Olympics in Salt Lake City. Kennedy, a medical doctor, has served in the Utah Legislature since 2013 and while he won more delegates at the State GOP Convention, he has struggled to find footing in the primary race against Romney. Perry, the Hinckley director, says the general election polling reflects the deep Republican leanings in Utah but Romney has the added bonus of name recognition and money to help boost him even further. “We are a long ways away from the general election, but there reason for Mitt Romney to be very optimistic about where he is right now,” Perry said. Monday evening, before the poll results were available, Romney told The Tribune he was “cautiously optimistic” about next week’s primary and planned to continue working hard until the ballots are counted. 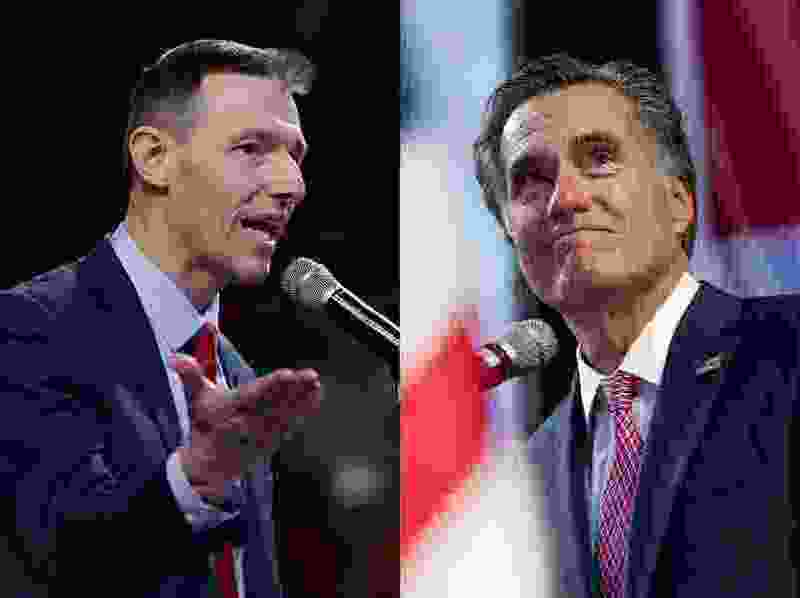 Romney finished second, behind Kennedy, at April’s Utah Republican Convention, but with enough delegate support to advance to the June primary. The former GOP presidential candidate had also gathered signatures under Utah’s dual-track primary election law to ensure he could not be eliminated by delegates in April. A point of division between Romney and Kennedy occurred in May when Romney questioned the participation of Texas Baptist pastor Robert Jeffress in the ceremonial launch of the U.S. embassy in Jerusalem, citing past statements by Jeffress that were critical and dismissive of Mormons, Jews and Muslims. Kennedy personally called Jeffress to apologize, generating a debate over whether the pastor’s comments — including that Mormonism is “a heresy from the pit of hell,” that Jews cannot be saved and Islam also is evil — constitute religious bigotry. Reporter Ben Wood contributed to this story.